In this June 30, 2014, file photo, President Barack Obama, accompanied by Vice President Joe Biden, pauses while making a statement about immigration reform, in the Rose Garden of the White House in Washington. Obama over time has been embraced and scorned by immigrant advocates who have viewed him as both a champion and an obstacle to their cause. Photo Credit: The Associated Press, Jacquelyn Martin, File. Immigration poses major challenges for President Barack Obama who thus far has had a complicated history with the politics of immigration. The son of a Kenyan immigrant, Obama has been both embraced and scorned by immigrant advocates who have viewed him as both a champion and an obstacle to their cause. In 2006, about 30 Mexican nationals desperate to avoid deportations that would separate them from their families appealed to him for help when he was their U.S. senator. He turned them down. Now, as president, a similar decision is upon him again, this time with the status of millions of immigrants at stake. Advocacy groups are hoping that Obama will leave a mark for posterity by moving to allow work permits for millions of immigrants living illegally in this country. "Some of the hard feelings could be forgotten at the end of the day if he acts boldly," said Janet Murguia, the president of the National Council of La Raza, a Latino advocacy group. Obama's record on immigration, however, is one of caution and deliberation punctuated by moments of determination amid some broken promises. With the president delaying executive action on the work permits until after the November congressional election, some Democrats worry that expectations have been raised beyond what he can deliver. "If they weren't sky high before, they are now," said Jim Manley, a former top aide to Senate Majority Leader Harry Reid. "I'm not convinced they will meet the expectations of the Hispanic community." White House officials say the delay will not affect the scope of what Obama intends to do. "The goal is going to be to do as meaningful a package of reforms as is available to the president through his executive authority," White House communications director Jennifer Palmieri said. Over time, Obama has built a varied immigration record. In 2006, Obama also angered Latino leaders when he voted to erect a 700-mile double fence along the U.S.-Mexico border. He backed compromise legislation in 2007 to overhaul immigration laws. Whether his support for a labor-backed change to the legislation contributed to the bill's demise remains a point of debate. 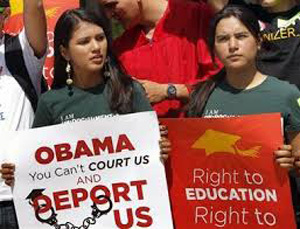 During the 2008 Democratic presidential campaign, Obama took the side of pro-immigrant forces in supporting driver's licenses for immigrants living illegally in the United States. That stand distinguished him from Hillary Rodham Clinton, who opposed them. Obama galvanized Latino voters with promises to take up an immigration overhaul during his presidency's first year. But once in office, he backed off to deal with the recession and launch a health care overhaul. Under his watch, deportation numbers began to rise. Obama argued he could not act unilaterally to reduce deportations. In 2012, as he campaigned for re-election, his administration announced a plan to defer deportation for certain immigrants who entered the country illegally as children. Since then, the program has deferred deportation and provided work permits for nearly 600,000 immigrants. He backed bipartisan immigration legislation passed in the Senate in 2013 and held out hope the Republican-controlled House would follow. This past June, Obama was finally convinced the House would not vote, and he promised to act on his own shortly after summer's end. This month, Obama decided to wait until after the election, saying he worried his actions would be undermined by campaign politics. Editor's Note: What should President Obama do to move immigration reform forward? In this article immigration is being discussed and how we should move forward. Immigration is one thing, that being said, all citizens in the US should be just that. Legal citizens. No matter your race, age or ethnic background you have a responsibility toi the US to do what you need to be a part of the US. No one should have the right to come in and just access the privledges of living here. With unemployment being as high as it is, many of us here in the US not being able to afford our own health care already. Should we escalate it even more for those that don't belong? No matter what the end outcome as Palmieri states "it is not going to be as big as we need". I say "We need to start somewhere." I believe it is right here with our people first. The president has a responsibility to the American people first. I agree. I have sympathy for the immigrants that are trying to escape multiple dangers in their homeland such as war, poverty, and more specifically, drug lords/gangs. However, if someone wants to live here and be an American, they should do it the right and legal way. Whether they are Hispanic, Chinese, European, Canadian, whatever, do it legally. Our country already does struggle in areas and we need to take of them together, and I hate to say it but immigrants are making us have discussions that we really shouldn't be having. We need to focus on health care and other social issues, not take up time discussing immigration. Granted, our ancestors were all illegal immigrants, so the philosophy of overall I struggle with. I agree with all the points that are being made. 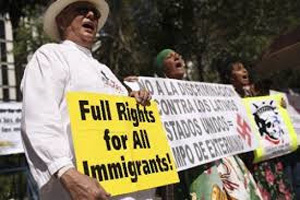 Illegal immigrants are making areas such as unemployment and healthcare harder for US citizens. However, it is hard to become a US citizen, with all the steps that you must go through, immigrants might see it easier to do it illegally. I am not saying that it is okay by any means but it poses the question, "Should it be easier and less of a process to become a US citizen?" If it was would we have as many illegal immigrants? These are just some questions to think about and how it would help reduce the number of illegal immigrants in the US. This is a really deep conversation consisting of our beliefs of immigrants in the world today versus the world when our ancestors were growing up. Citizens of American have a responsibility to respect their homeland and if you choose to come to America to have a better life for you and your family it's their responsibility as well. Health care is a big thing going on right now but the people that are coming here for safety and choice of religion have a good reason to coming here. If one is sneaking in that might be a little different discussion. But the people that choose to come here for good intentions and go through the regulations to make it legal I have deep respect for them because they are trying to make their lives richer. In addition to their personal lives, people here get a taste of other cultures and an opportunity to learn about different ways of life. Great points! I agree with you 100%. Unemployment and healthcare is a huge issue in the United States right now. The unemployment issues pose the question of, "are we willing to work for pay lower than what it takes to maintain a certain lifestyle within this country?" A problem that results from this is the fact that illegal immigrants are willing to work for almost nothing. We as legal citizens understand, or should understand, where our money goes regarding taxes, what it takes to live a somewhat normal life, and what it takes to support our family if we have children, etc. I think that persistent action needs to be taken towards our immigration laws. Our political leaders need to prioritize what's important to healthy functionality of our economy and make some moves. I think the immigration issue is a big one and needs to be addressed with urgency. As we have all seen in the news for years now, legal/illegal immigration is a big discussion that doesn't seem to have a resolution anytime in the near future. Every person that tries to enter this country illegally or legally is looking for the "American Dream." I believe that if someone wants to pursue their dreams, work towards goals, and provide their family with a better life, they should do it legally. They should have an equal opportunity, like everyone else that lives in this country legally, to go to school, work to support their family, pay taxes, and make way for a better life. I believe that no matter the race, age, gender, or ethnicity, one should use their drive and determination to make a positive impact in their own lives. I don't think a person should use the "sympathy" card to earn their way and "work the system." The problem with immigration that we have right now is a direct reflection of what is wrong with most of our governmental issues. At the same time, there are so many more people wanting to live in this country and it's starting to become out of control. I think that something needs to be established before things become even more out of hand. We all deserve life, liberty, and the pursuit of happiness if pursued in the proper manner. I totally agree. It just really pulls me from both sides because I want my country to crack down harder on immigration, but at the same time I know that (even if it's a small percentage) some of these immigrants are trying to escape horrors we are lucky to not have to witness (drug lords, extreme poverty, etc.) like I mentioned earlier. My instincts are to help those who really DO need help, but the ones who are already here, legally, need to be taken care of first. Equality amongst citizens is very important. This a free country, and it’s exactly why people want to live here. We the American population have so many problems needing to be addressed right here, with our unemployment, and our healthcare, with social security and even the prison systems. I find it ironic that the President of the United States is willing to make exceptions for so many that are NOT citizens at the expense of our own people. Think about the expense, not like our deficit is already out of control. Should we not clean up the issues we have here? Does the direction we stand now just amplify our problems that much more? This idea just came to me...and I don't really have an answer but I want to know what you guys think. It sounds like I'm going to diverge but stay with me. Take the war on drugs we are facing now: the illegality of marijuana causes crimes such as distributing, selling, and possession of marijuana. Now, make marijuana legal- crime goes down. NOW what if we not necessarily let everyone into this country, but could it be that we have a huge problem with it because we put so much stress and time into it? We make it so hard to get into this country- the immigrants think "Oh my gosh that country is so protected- it must be awesome on the other side!" So it just motivates the illegals to cross over even more? Maybe I'm thinking too hard, but what do you all think? I just asked similar questions in a response above. If becoming a legal US citizen was made easier would the number of illegal immigrants decrease? At the same time this might be easier said then done. All the steps and processes in place to become a US citizen might be necessary to insure that they are letting the right people become US citizens. I think that they could eliminate certain steps in the process of becoming a citizen. The post that I posted a few minutes ago kind of goes along the same lines but more from a business perspective. I do think that the strict laws and regulations that are in place to become a legal citizen do hinder groups of people from attempting to be legal in this country. I think they shy away from the legalities and attempt to bypass the system that's already in place. I like the marijuana rules analogy - there would be less crimes if it were legal (not that I agree with the legality of marijuana). Just like the point that I brought up, our economy might stimulate more if we brought more legal citizens into the country - less unemployment equals a better economy. I was speaking to coworker of mine about the immigration situation in America. The context of our discussion was that of business and whether or not the diversity in our nation has made our country flourish in a business sense. So, essentially, I have a question: does our diverse society produce a successful and flourishing business society? In my personal opinion, I believe so. I think that most legal immigrants may bring another "stance" on how the business world should be operated. I feel like most of the successful entrepreneurs are college-educated students that bring a part of their homeland to the United States. I could probably go on for a while discussing this. What I'm trying to get to is: why don't we make this immigration issue more of a priority for our country? I believe that we should establish a system of prequalification to allow more legal immigrants to have an opportunity to succeed and provide for their families. I believe that the unemployment rates would go down and our economy will spike. How do you all feel about foreign exchange students? At the high school level or even college. These students are coming here to learn from our education system and then many times go back to their country? What are your views on individuals coming over for a work visa? Example: I was a camp counselor and there were a handful of people that came over for the summer to work at the summer camp. The movie that comes to mind is The Proposal. This is somewhat unrealistic but still has the underlying issue of immigration. The main character has to be deported but then tells a lie that she is getting married to her coworker. Turns out she falls in love but at first it was a huge story. Some questions that I was wondering about. Feel free to answer and add new ones. Immigration has always been a major topic. I think if we sit down and see why people immigrant to the US, we would have more leniency. from foreign friends of mine, I have heard that our immigration policy has become a lot stricter. It is so disappointing to hear that when the United States first began as a free country where anyone was welcome. This article was overall a good article but I think it could of talked a bit about past presidents and did some comparing and contrasting. Is our current president one of the only ones that has had trouble with immigration or have previous presidents had problem too? I think that these Immigrants had a choice when they first arrived here, they new from the beginning they were not legally living here. Just temporary living situations should scare anyone. It is the immigrants own fault for making a life here in America when they new they could possibly have to leave at any given time. In Obama's situation during reelection he promised to get work permits for those living here illegally. He followed through on this promise but I don't think that's good. Although these people can now get jobs in our country they could still be sent back to where they came from at any given moment. Obama making it possible for them to start a life here is one of the biggest problems in this situation. This article was overall a good article but I think it could have talked a bit about past presidents and did some comparing and contrasting. Is our current president one of the only ones that has had trouble with immigration or have previous presidents had problem too? I think that these Immigrants had a choice when they first arrived here, they knew from the beginning they were not legally living here. Just temporary living situations should scare anyone. It is the immigrants own fault for making a life here in America when they knew they could possibly have to leave at any given time. Obama was raised by an immigrant so of course it would be a hard decision for him to chose to keep out to allow people into this countries. Although he is helping everyone get started and stay around i believe it would be hard for someone to be in a completely foreign place. There is no way I would ever want to go live in China for a long period of time. I know nothing about it and i just wouldn't fit in. Cootoes to those who stay in unknown territory. Obama has done thing right thing in many situations but letting non US citizens stay here is not right. They make families in the US and then sometimes are deported back from where they came from and that is just not write in many situations. If someone is a permanent resident, citizen or otherwise, sure their children should be subject to the 14th amendment and a citizen by birth. If someone comes on a temporary tourist visa or crosses the border illegally, I'm not sure that I believe that child should be an American citizen. Already the US population is going to have gone up by 50% in another 50 years and by the time a child born today hits middle age. Think of what all those extra people will do to congestion, resources, urban sprawl, wildlife habitat and the global environment. In fact there is not any pressing social issue from the environment, income inequality, to political division which is not made harder to solve with that increased population. Now we will have tens of millions additional people, as a result of chain migration and childbirth from these unnecessary immigrants. Our children will live in a land which is increasingly overcrowded, more unequal, more divided, more resource depleted and more environmentally devastated. GOD created this world everyone should be created equal. i believe there are still a lot of concerns that Obama needs to think about and change the immigration law as well. Obama has a hard time to begin with in this situation because of his family background. in a way this is almost relatable to him not letting his own mother in the country. It is what it is and he needs to do what is necessary to keep this country in line. He had done some good and some that could had been a lot better in his presidency. But in this situation he cant let his own emotions get in the way.